This is the fourth in a new advanced series of posts written by Imanol Pérez, a PhD researcher in Mathematics at Oxford University and an expert guest contributor to QuantStart. In this post Imanol applies the Theory of Rough Paths to the task of predicting which country a company belongs to based on the evolution of its stock price and traded volume. As we saw in the last article, the signature of a path can be a powerful tool to tackle machine learning problems. The previous article showed an application to a toy problem, but as we will see in this article rough path theory and signatures can also be used in more practical applications. More specifically, we will build a model that predicts, and quite accurately in fact, which country a company belongs to using the evolution of its stock price and traded volume. Obviously, the way the price of a stock changes over time varies from company to company. If a company is profitable and investors think it will still be profitable in the future, the price of its stock will probably rise. If, on the other hand, a company is near bankruptcy it is quite likely that the price will fall. However, intuitively it makes sense (and this is in fact what one observes in real life) to expect that outside factors that affect the country as a whole will also have an impact on the price of a stock. Therefore, it is reasonable to think that prices of stocks that trade on the same country will have some intrinsic similarities, that go beyond the performance of each particular company. The objective of this article will be to capture these similarities using signatures. We will make use of two main ingredients for this task: the daily price of the stock over a year, and the daily volume over the same period of time. We will consider stocks of three different countries: United States, United Kingdom and Germany. As we will see, the model can correctly predict the country a stock belongs to with an accuracy of 97%. # We will consider data from 2016. # Load data from each company. # If the company doesn't have any data, ignore it. that will later be used. # Store the stream of data. # Store the country the stock belongs to. for a set time period. Then, we divide the data into two subsets: the training set, which has 70% of the data, and the testing set, with the remaining data. The training set will be used, as the name suggests, to train the model. The testing set, on the other hand, will be useful to see how accurate our model is with out-of-sample data. # and testing_set, with the remaining 30%. # The inputs and outputs to train the model are constructed. # Inputs and outputs to test the model are built. # We apply the model for signature orders 1 to 4. # The model is trained. # We calculate the predictions. # and print it then. The whole code can be found in this repository. 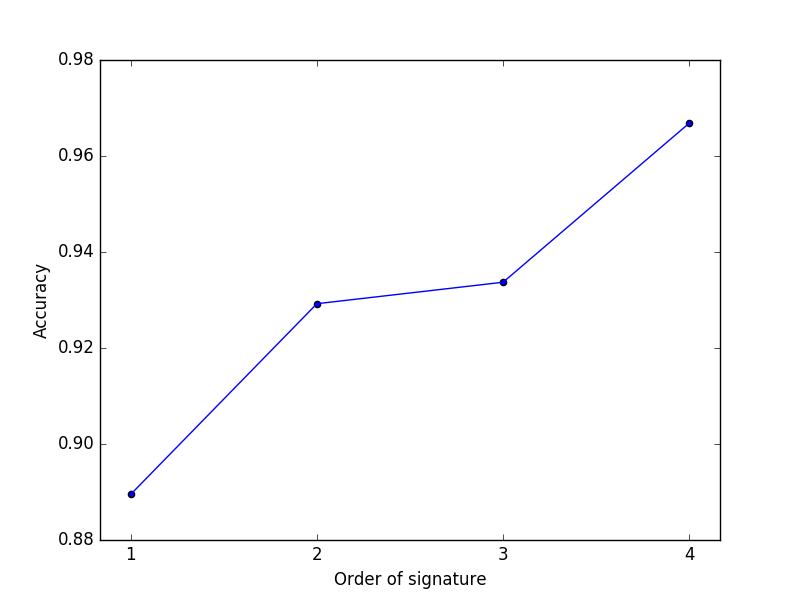 If we test the model for different signature orders, we see that the best results are obtained for the signature of order 4 (see Figure 1). In this case, the model correctly predicted which country a company belongs to with an accuracy of 97%. Graham, B. (2013) "Sparse arrays of signatures for online character recognition, 1308.0371"
 Király, F. J. and Oberhauser, H. (2016) "Kernels for sequentially ordered data, 1601.08169"